Blueball Slider design features an attention grabbing slideshow header in a mobile-friendly responsive layout! Check Out The Blueball Slider Demo Sites! Blueball Slider features an attention grabbing slideshow header in a responsive mobile-device-friendly design layout. One of the most requested items we recieve in our support inbox from Sandvox users is "How to put a slideshow into the header area" instead of a banner image. Now you can do that easily using our Blueball Slider design! The Blueball Slider design allows Sandvox users to quickly add a slideshow into the header area on their Sandvox site using a small bit of code into site code injection or page code injection. Refresh your page in Sandvox after that and boom, you have a working slideshow to capture your viwer's interest and promote your site with. Blueball Slider also provides your Sandvox site with all the Google mobile-friendly responsive features modern Sandvox site layouts need for optimal display on all desktop and mobile devices. Features like built-in desktop, tablet, and smartphone layouts, 15 custom Google fonts to use, 50+ preset optimized slideshow images to call and display in your site slideshow header (or use your own custom images), and more. The Blueball Slider design automatically scales and repositions images and other page elements on your Sandvox site pages responsively, providing your Sandvox site the best possible display results in browsers on tablets and smartphones, along with the standard desktop computer display you are used to. 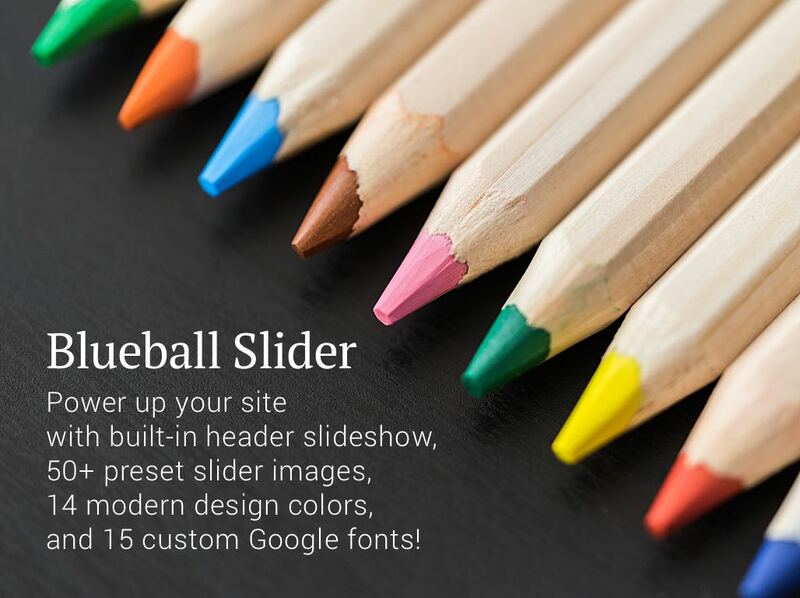 The Blueball Slider design comes with 14 color schemes, 50+ banner images, and 15 custom Google fonts! Be sure to check out the 14 Blueball Slider design demo sites and download the 4 Blueball Slider readme files using the sidebar links, to see all that the Blueball Slider design can do for your Sandvox site today.